She looked to the cliff side, then back at him. “I don’t know…” her voice was timid, thin. She sounded even younger than she looked. The old man also didn’t know. He didn’t know what to do about her. Something seemed off about this whole thing. About her. She lifted her hands to her face, covering her eyes, and began to sob. Her cries strained against the rain, emerging like an eerie siren. The downpour had matted her dirty blonde hair to her skin and clothes. Combined with her awkward gait, it all made her look like a bedraggled mermaid who’d just grown her legs and didn’t quite know what to do with herself. The old man’s heart burned for this young girl. Not in a romantic way, no, not that—this was a battle. She was fighting something. And he could help tame that beast. In her, he saw a daughter, a child in need of guidance. “Please miss, come inside,” he said. When he heard the urgency in his voice, he realized he was on the verge of pleading with her. He waited, muscles tense despite his attempts to remain the calm mediator. She just stood there. She wasn’t listening. She turned back to look at the cliff side once again and took another step toward it. The man’s heart skipped a beat. Was she really planning on jumping? An image of a woman’s crumpled body hanging halfway out a broken car window exploded into his mind. Her facial expression said she was terrified. She’d died terrified. The beast had told her it’s what she wanted, but it wasn’t what she’d really wanted. It couldn’t have been. The girl’s head wrenched around and her eyes fixated on the old man. There was no looking through him now. It was as if all she could see was him, and he was the object of her rage. Her brows furrowed and her lip curled into a sneer. The old man felt completely lost. How does one handle this? There was more space between him and her than there was between her and the cliff. Words, not his actions, were his weapons here, right? The old man held up a hand, asking her for her ear. The girl looked frantic. Her eyes darted from the cliff to his house and to the trees in the distance. Finally, she took a shaky step toward him. The old man sighed in relief and opened the door wide as he waited for the girl to plod across his lawn. As she climbed the porch steps, she looked to the side, sheepishly allowing her eyes to meet his. They were gray, almost the same color as her sweater. Not a single wrinkle had been etched into her skin, not a liver-spotted mark of adulthood was tattooed anywhere on her body. She was probably only about thirteen, and that made his heart ache even more. She was too young to be so sad and alone. He followed her inside. She stopped just inside the door, her skinny little legs shaking as droplets ran down them and pooled around her feet. He pulled out a chair and gestured for her to sit down. The girl’s sullen face turned toward him, then back again. She sat down and folded her hands in her lap. The old man walked past her and selected a porcelain cup decorated with dandelions from the cupboard. He lifted the tea kettle and poured out the light yellow liquid. “It’s just…” she looked up. Her head’s silhouette against the dim light still coming through the glass made her look so thin and out of place. She hesitated, clearing her throat. The old man took the cup and saucer in his hands and moved toward her. He stopped, taking a moment to process what he’d just heard. “What voice?” he asked. Was she hearing things? He wondered if she had a weapon on her. Was she dangerous? She didn’t look dangerous. But her words had chilled him. What voice? “Th-the one that we all hear,” she said, turning to face him, circling her finger in the air, as if pointing to other people he couldn’t see. She clutched the backrest of the chair with her other hand and looked at him, her eyes wide with fear. No, fear wasn’t a strong enough word. With terror. He knew that look. The woman’s body was removed from the vehicle with care, and they draped a sheet over her to keep anyone from really seeing her. But he’d seen her. He’d never forget her. Suddenly, he realized the tea cup was clattering against the saucer as he trembled. The old man’s brows furrowed. But why was he frightened? This was a young girl; a mentally troubled one at that. She clearly needed the help of a doctor. He would have to call for an ambulance, but she couldn’t know that. She’d run off again if she knew. He feigned a cough to cover up his apprehension and approached her. “Which women?” he asked, setting the tea in front of her. Now he watched as the steam curled up toward her face. Leaden, lifeless eyes stared back at him. He recoiled, his palms breaking into a sweat, his breathing quickening. She moved her hands slowly and wrapped her long, thin fingers around the cup. She’s just a girl, he reminded himself. Not a beast. She’s only fighting a beast. The old man took a seat across from her and swallowed hard. Discreetly, under the table, he slid his hand into his pocket and pressed the “emergency call” button on his cell phone. He knew all too well where it was, having taught himself to be ready—he was not getting around as well as he used to, and he wanted to be able to help himself in the event of an emergency. He hoped that the operator would be able to trace the call to their location. He cleared his throat, obscuring the muffled voice of the operator coming from his pocket. “Which women?” he asked again, intertwining his fingers and shifting his hands nervously up and down on the tabletop. Please return next week for part 3! Subscribe for updates using the link at the top of the page or on the menu on the sidebar! 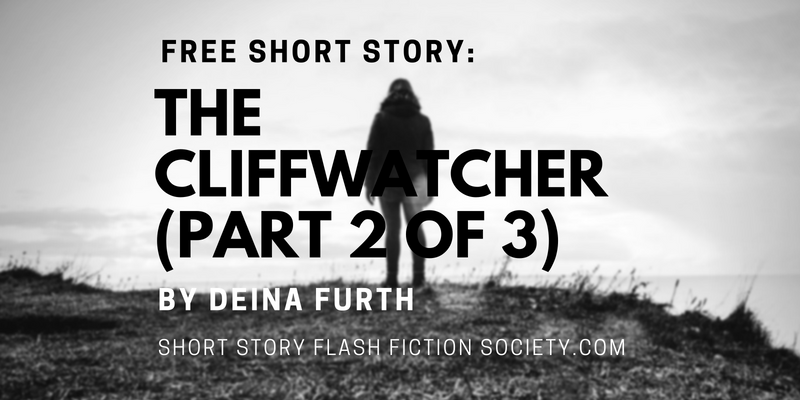 If you’re interested in reading more by Deina Furth, please visit her Amazon page here or her website here.